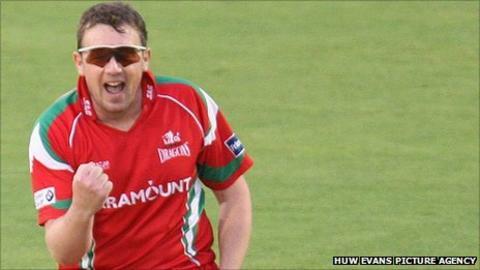 Robert Croft insists he has no plans to retire after Glamorgan awarded the veteran spinner a testimonial year. The 41-year-old, the first Glamorgan player since Don Shepherd in 1960 to take 1,000 wickets, will enter his 24th professional year in the 2012 season. But Croft said: "I have no plans for retirement at the moment. "The body is aching a touch but that is September and coming to the end of the season. I'm still going to train hard and prepare myself for next year." The 2012 season is the final year on Croft's current Glamorgan contract but he insists he is "not giving up." The former England international, who made his Glamorgan debut in 1989, is only one of 15 players to play more than 350 first-class appearances for the Welsh county. Croft was an integral part of Glamorgan's golden era and helped the county win the 1997 County Championship and three Sunday league titles. "Robert has had a remarkable career with Glamorgan and England," said Colin Metson, Glamorgan's managing director of cricket. "And there are lots of wickets left in him. "A testimonial in 2012 is thoroughly well deserved." Alan Hamer, Glamorgan's chief executive, added: "Robert's contribution to Glamorgan both on and off the field has been immense - there is no finer recipient of a testimonial."